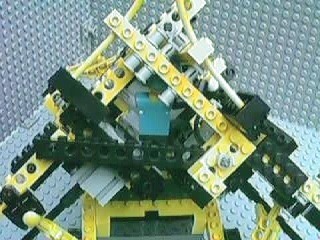 In August 1999 I experimented with robot designs that move on three wheels arranged in an equilateral triangle, and with complete rotational symmetry (i.e., the whole robot looks the same if rotated 120 degrees). 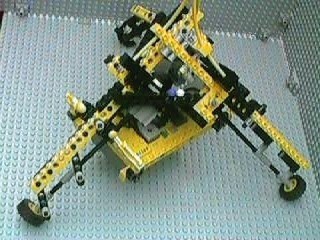 There are three "legs", each with a backbone consisting of two yellow 1x16 beams. 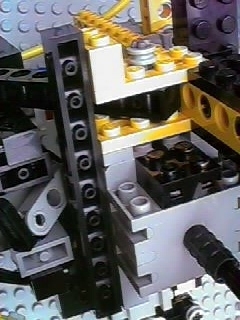 Each leg is connected to the other two via cross-braces, which are black 1x12 beams. 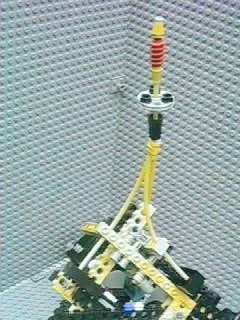 Each leg also supports a motor which directly (no gears) drives a wheel located at the bottom of the leg. 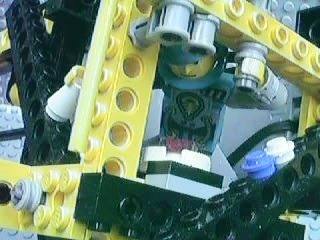 Except for the RCX, the minifig "driver" and other decorations, the model is completely symmetrical. The cross-brace is the black beam that runs diagonally in this picture. Behind it is a shorter black beam ("horizontal" in this picture) that is helping hold one of the motors. You can also see the motor's axle. Behind all that you can see two gray 1x10 plates and the ends of two yellow 1x16 beams; these are holding the RCX. 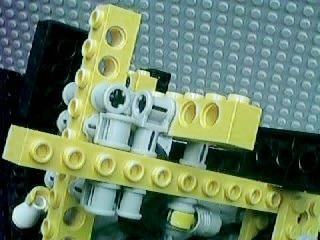 There are two angle beams connected to the 1x16 yellow beam with friction connector pegs (the black connector pegs) and the other end of each angle beam has connectors to support the axle while allowing it to turn freely. 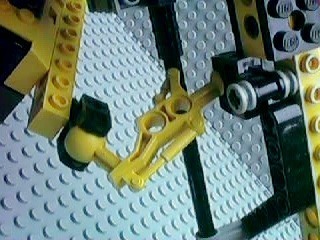 Each of the four struts is positioned slightly differently because the angles are different, but all four struts use the same parts (a Throwbot ankle socket at each end connected by a Throwbot leg). 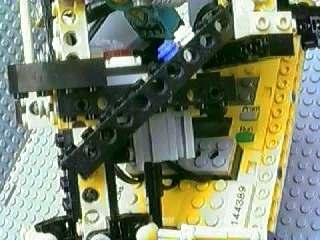 Because there are four struts and only three main legs to connect to, two of the struts share one of the main legs. Usually Minidave does what I tell him to, but not always. The big blue and white buttons perform emergency shutdown and eject, respectively. 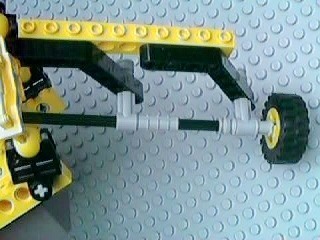 This robot moves by turning two or more wheels at once. Call the legs A B and C (doesn't really matter which is which). If you run all three in the same direction, the robot will turn. If you run A and B clockwise, the robot will sort of "pivot" around the point where wheel C touches the ground. (C can't move because the motor is in "braked stop" mode, resisting movement.) If you then stop A and B, and run B and C counter-clockwise, it will pivot around A in the opposite direction. If you repeat this over and over again, the robot will "wiggle" and gradually move forwards in the process. I also discovered that on certain smooth surfaces you can make it move forwards simply by running two motors in opposite directions and leaving the third motor stopped. There were also a bunch of compound movements (like turning and moving laterally at the same time) and some movements (like running just one motor) that didn't do much of anything.